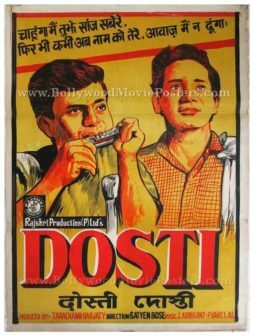 Reissue Bollywood movie poster of the super hit 1964 Hindi film Dosti (Friendship) for sale. Featured here for sale is a reissue Bollywood movie poster of the 1964 award winning black and white Hindi film which featured Sudhir Kumar, Sushil Kumar & Sanjay Khan (debut). The film’s touching plot that captured the friendship between two physically challenged individuals won critical acclaim. Dosti was declared a super hit at the box office. The film was nominated for seven Filmfare awards and bagged six of them! Printed and circulated a several years after the original release of the film (somewhere in the 1990s), this photographic Bollywood movie poster was originally designed for publicity of the film but never ended up being used. This Bollywood movie poster features still photographs of the two lead characters of the film who play physically challenged characters – one a cripple and the other visually impaired. The poster capitalizes on the six Filmfare awards won by the film, by featuring them prominently. Dosti (Friendship) is a 1964 black and white Bollywood film starring Sudhir Kumar and Sushil Kumar in lead roles. The film focuses on the friendship between two physically challenged boys. Dosti was declared a super hit at the box office and as a result included in the 4th Moscow International Film Festival. Songs from the film became a rage throughout the nation and continue to be played till today. The winning combination of lyricist Majrooh Sultanpuri, music composers Laxmikant Pyarelal and singer Mohammad Rafi delivered hits such as Chahoonga Main Tujhe Saanjh Savere. Dosti bagged Laxmikant Pyarelal their first award and made them a household name in the Indian film industry. 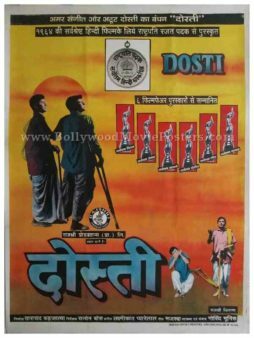 Beautiful vintage hand painted Bollywood poster of the super hit 1964 Hindi film Dosti (Friendship) for sale. This is an actual surviving old publicity poster of the 1964 award winning black and white Hindi film, which featured Sudhir Kumar, Sushil Kumar & Sanjay Khan (debut). Dosti was declared a super hit at the box office. The film was nominated for seven Filmfare awards and bagged six of them, making this old Bollywood movie poster highly collectible! Printed and circulated a few years after the release of the film (somewhere in the late 1960s), this artistic hand painted old Bollywood poster was originally designed for publicity of the film but never ended up being used. This vintage Bollywood poster was originally designed on a hand drawn canvas by an old Bollywood poster painter, making it very collectable. This beautifully designed hand painted poster features large portraits of the two lead characters of the film – a cripple (portrayed playing a mouth organ in the poster) and a visually impaired individual seen on the right. A brilliant yellow and red color combination is used in the design of the poster, which gives it a stunning vintage feel. The poster capitalizes on the popularity of the super hit song from the film sung by Mohammed Rafi, “Chahoonga Main Tujhe Saanjh Savere” by announcing its lyrics on the top.